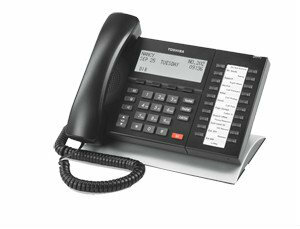 The Toshiba IP5132-SD digital telephone with Back-Lit LCD display has an easy to read screen, one-touch programmable buttons and ergonomics design for comfort and easy-to-read feature buttons. The IP5132 SD uses 1-channel on MIPU or LIPU/LIPS in Strata CIX100/200/670, or 1-channel on GIPU8 or GIPH in CIX40. Does not include local power supply or endpoint license. Color – Black.